Our first three-day weekend here in Santiago was a weekend of firsts: we went camping, hitchhiked(! ), and talked our way into a tour of the local reservoir. 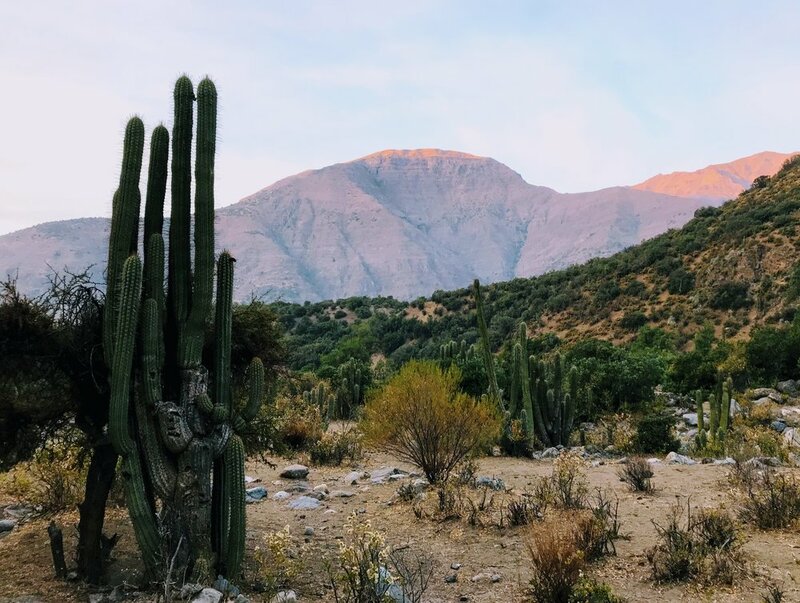 WHAT IS CAJON DEL MAIPO? 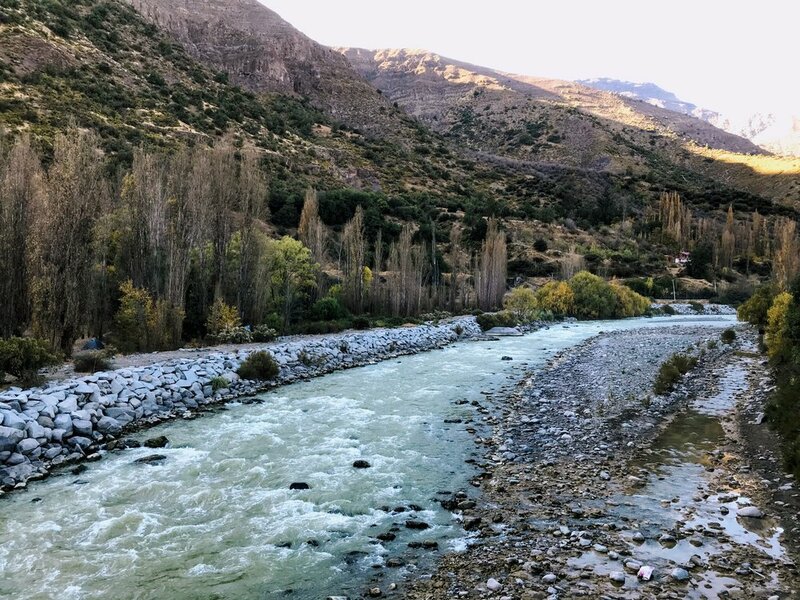 Cajon del Maipo directly translates to "Canyon of Maipo", and is a long stretch of mountain reserve along the Maipo River. It's an outdoors destination known for its glaciers, trekking, camping and wildlife. It's also very close to the city of Santiago, making it a common weekend destination for visitors who want to escape the city. Before I went to Cajon del Maipo, I didn't quite understand that the name refers to the entire length of the gorge. Since it's mentioned so frequently by Santiguinos, I assumed it referred to a single place, with the beautiful backdrop of the snow-capped mountains that I had seen in so many pictures. With that thought in mind, we took the rural 72 bus to a town called San Jose de Maipo, an hour and a half outside the city. Our plan was to camp at El Sauce Campgrounds, which I had chosen based on some help I had received from a fellow expat. The trip was pretty easy, and it took us through the suburbs of Santiago that I had never seen before. When we got off the bus, it was still about a 20 minute walk to the campgrounds. We got a bite to eat before setting out to find El Sauce. Easy peasy. We ate these empanadas next to an incredibly healthy German man eating homemade tabouleh. El Sauce was an interesting experience. Campgrounds in Chile are mostly run by private companies or families, so they can vary greatly in amenities. It's very common to have access to electricity, hot water, overhead tents and sometimes even pools! And you pay per person, rather than for the site itself. Once we chose our site, we set out in the mid-day heat (it was 78 degrees!) to find a suitable hike (still thinking I would just run into the beautiful glaciers). A few minutes from our campsite, we found a sign for a private park with numerous senderos (trails) that we could walk through for a small fee. We had about two hours to explore, so we chose a path and hoped for the best. While most of our walk was underwhelming, we got some stunning shots of the sunset as we made our way back to camp. I'd love to go back though, because there are clearly some cool things to do and see. The next morning, I was still determined to make it to the glaciers but was getting very hopeless responses from the local people about getting there without our own vehicle. There was no public transportation (micros) to the "cooler" hikes, so our only options were to book a tour beforehand (which we hadn't done), or rent a 4x4 and drive up the mountain (nope). We were clearly very prepared. A very common thing to do here in Chile is hitchhike (hacer un dedo), which speaks volumes about the safety of this country (even the carabineros (police) suggested this to us). Mike wasn't so into the idea, but before he had time to protest, an older Chilean couple honked their horns at us, and drove us 15km until the last town on the main road called San Gabriel. When we got there, we assumed there were senderos here, but apparently that wasn't the case. While we stood there contemplating our next move, there was a tour van that stopped for a few minutes right by where we were standing. With our pleading eyes and broken Spanish, we somehow convinced them to let us join their tour, wherever they were headed. While they were VERY weirded out, and slightly concerned as to what we were doing in a nothing town in the middle of Chile without any plans, they were also warm and incredibly friendly. Thanks to Manke Tour, and our new friends, Paulino and Nicolas, I finally got to see those precious glaciers I had been waiting for! We spent the entire day with a group of about 20 Chileans, and learned about the embalse (reservoir) that feeds water to the population of Santiago. If you visit (please visit! ), add this to your itinerary (and maybe book a tour beforehand?). CHECK OUT MY RECOMMENDATIONS FOR SANTIAGO DAY TRIPS!